Daniel Laust films at a recent branch gathering. Story by Chris Meehan. Photo by Bob Cunningham. Servant Branch has begun live video broadcasts of their branch meetings that members can watch on the Internet. The broadcasts, which are only available to Servant branch members, are a new way for brothers and sisters who can’t attend the meeting because of illness, old age, travel, etc., to participate in the life of their branch. “We wanted to help absent branch members be more united in heart and mind with those in the meeting room,” explains principal branch coordinator Joel Kibler. The project is just four months old, but reports from branch members indicate that it has already begun to fulfill its purpose. Pat Walsh is a long time branch member who suffers from post-polio symptoms and hasn’t been able to attend meetings for about 10 years. In the past she listened to the meeting at least a few days later on CD, but now she watches it live and can talk about it afterward with her housemate Penny Arndt. “The broadcasts show my brothers and sisters as they sing and pray, and that helps me feel more a part of what’s going on and join in,” she says. The idea for the broadcasts came about six years ago, when a group of branch members began meeting to talk about how to help aging community members. Last year, the branch’s CD duplicator broke, and Joel saw an opportunity. He spoke to the branch coordinators and they agreed to study how many people could benefit from live video broadcasts. After the study, the numbers looked sufficient to justify the expense, so Joel asked Tom Bowar to begin researching equipment. Eventually, on Tom’s recommendation, the branch purchased two video cameras, along with a tripod and a computer to run the system. Now Tom leads a team of five that includes Ken Larsen, Dan Laust, Elizabeth Pease and John Gruber. 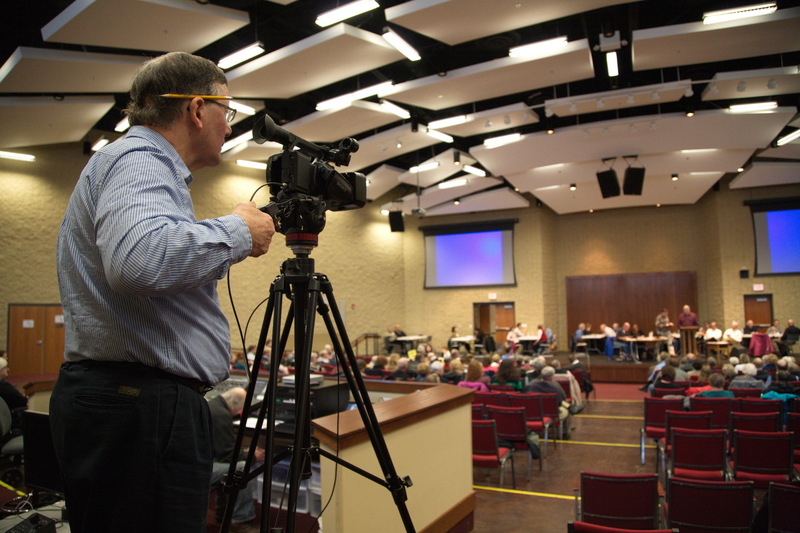 A typical community meeting requires a three-person crew, including two camera operators and someone to manage the computer where the feeds are mixed together and processed for Internet viewing. Two cameras on tripods are positioned at the back of the auditorium facing the stage. A third camera, controlled by a remote, will be used starting in December. It will be mounted at the front of the room, where it can pick up shots of branch members. After the meetings, the video recordings are archived and placed on a private page on the website Vimeo.com, where branch members can access them for about three weeks. Thanks everyone I really appreciate all your work. Kudos! Thank you for this use of modern technology to bring unity! I would like to see this done in South Bend also. What a great idea. Fantastic use of technology for Christ! What a wonderful gift to those who can not be at a branch meeting. We snowbirds would love the opportunity to see the branch meetings live all winter. I can hardly wait until we make this available for our South Bend branch. Thank you for caring for us seniors and home bound. Maureen McDonough. I am so thankful for our CM broadcasts. Often I am unable to stay for the whole meeting due to family arrangements, and I audio livestream the rest of the meeting on my way home. Thank you! Way to go John Gruber. Thanks for serving. Thanks to Tom Bowar and staff for the hours of dedication and service to bring this miracle of technology about in our life together! May it spread quickly to other branches. Awesome. I never would have thought of this. Thanks for loving our brothers and sisters wherever they are.